Just when it looked like the Albert Pujols sweepstakes was down to the St. Louis Cardinals and the newly free-spending Florida Marlins, the Los Angeles Angels stepped in and shocked the baseball world. The team signed the slugger to a ten-year deal worth $254 million. So how did hobby react to the news? At the OC Dugout in Anaheim, there was excitement in the voice of Brian Nicalek, co-owner of the shop, "It's surreal," he said when asked about the reaction from his customers. "We're not used to the huge signings." As the news broke, it was still early on the west coast. "Both me, my partner and my employee all woke up to several text messages." Nicalek also mentioned there were several posts on the store's Facebook page and a handful of phone calls asking when the first Pujols signing at the store would take place. Nicalek did say there's been past interest in Pujols cards, but he's anticipating a lot more over the next couple of months. "Last year we did good for rookies," Nicalek continued, pointing to Mike Trout and Mark Trumbo. "This year the focus will be Trout and Pujols. If the team starts winning more, cards will definitely sell well." The mood is much more somber in the St. Louis area, as fans and shop owners come to grips with one of their all-time legends walking away. Even still, there hasn't been a massive backlash in hobby shops. At least, not yet. "It has been kind of slow today," said Randy Fauth, owner of Sports Card Dugout. "People are still in shock." David Doelling of Southtown Sluggers shared similar sentiments, "Several ladies I've spoken with today say they feel like they've been dumped." He did note that even with the World Series victory this year, there hasn't been the same demand for Pujols items as there had been in the past. "We've been anticipating something for almost a year," Doelling continued. "Ten years for that kind of money is too much. It could hamstring the team. The real key is to see what the Cardinals do with the money ." Although not as dramatic as other contract discussions have been with other players, both Pujols and the Cardinals were somewhat public in extension talks over the past season. Collectors in the area sensed it. "For about the last year there hasn't been the same affinity and love affair with Pujols," Doelling said. "The sale of Pujols stuff, even after Game 3 in the World Series, wasn't there." Doelling had just one customer come in today looking to dump a small Pujols collection that wasn't very extensive. Given the size of the contract, both Missouri shop owners sided with their hometown club. "The general feeling is that was part of the Cardinals, not the Cardinals," Fauth said. "Most people are resigned to the fact that the Cardinals did the right thing." Doelling had similar sentiments, "Ten years for that kind of money is too much. It could hamstring the team." Some of the sting came through from Fauth when discussing the legacy Pujols leaves behind in St. Louis, "Stan Musial is an icon and has always been considered the greatest Cardinal ever. That was secured today. will never be close in memory to Musial. I don't know if he'll be as high as Lou Brock and Ozzie Smith." What's in the Cards for the Former Card'? Panini was quick to announce they were altering their plans for both 2011 Donruss Elite Extra Edition and 2011 Playoff Contenders Baseball. 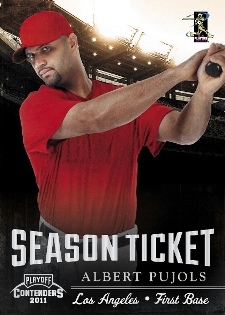 Pujols' card for both sets will now show his new team and not St. Louis. Because Panini holds an MLBPA license and not a MLB license, the impact won't be huge as the change is a matter of switching city names. Pujols will still be pictured in logo-free clothing. 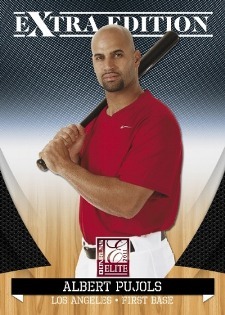 In 2011 Donruss Elite Extra Edition, Pujols will be featured on a base card and on several numbered parallels with print runs ranging from 200 down to 1. In Playoff Contenders, Pujols has a base card, a one-of-one Seasons Tickets Championship Tickets card, an Artist's Proof (/49) and a First-Day Printer's Proof (/10). We reached out to Topps but haven't heard back from them. However, based on past major off-season signings, it would be more shocking if they didn't somehow acknowledge Pujols' move west in 2012 Topps Series 1. In recent years, they've made last-second variations with airbrushed uniforms. As for prices, it's still too early to see how the market will balance out. In St. Louis, Pujols leaves behind two World Series championships and a decade of some of the most consistent offensive numbers in the game's history. Any St. Louis collectors looking to dump their Pujols collections will likely find willing buyers on the West Coast, which is a huge market. That should offset any short-term losses and may even lead to a short-term boost in Pujols' cards. Doelling said that he expects autographed baseballs to see some gains as well since they're not team-specific. But in the big picture, it comes back to legacies. Pujols could have finished his career playing for a single team. His numbers and World Series rings guaranteed his place in history. It's still there, but it's not the same. It was that perceived team loyalty that was part of his hobby x-factor. But now that's gone and Pujols is like so many other athletes who have signed elsewhere for huge money. Check out our Albert Pujols baseball card guide, which includes a complete rookie card checklist. I was gonna go down to Sports Dugout and get my son a Pujols rookie card if he stayed in St. Louis. Now we’re investing all our cardboard dollars on Stan Musial. Pujols ripped the hearts out of thousands of loyal fans in this city. He said he wanted to be a Cardinal for life and was willing to take the hometown discount. He lied. In this home we used to think he was a great ballplayer. Not anymore. Now he’s just another accomplished ballplayer. I hope he goes into the hall as an Angel. He doesn’t deserve to be part of St. Louis lore.